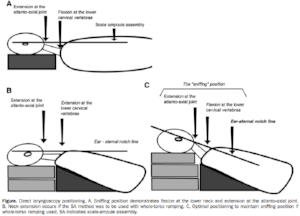 There has been some recent controversy in the EM, anesthesiology, and critical care literature regarding the use of ramped positioning during intubation. Many anesthesiology studies in the operating room have shown increased time to desaturation with ramped positioning (20-25 degrees). Then, a recent RCT in the ICU by the Check-UP investigators showed no difference in safe apnea time, with worsened glottic view. We noted in that post that there was serious concern about cervical hyperextension, based on the description of the ramped position and images provided in the study's appendix (see the post link above). Clay did a podcast on that paper with Chip Lange on TOTAL EM if you prefer audio. Figure A is the generally accepted sniffing position in a supine patient. This optimal positioning is achieved through flexion of the lower cervical spine and extension of the occipito-atlanto-axial complex. Novice intubators are often taught to achieve this position by connecting the ear and sternal notch in a line parallel to the ground. This “parallel line” mantra breaks down when the ramping position is used because a horizontal parallel line in the ramped position (Figure B—as done in the Check-UP study) causes lower cervical extension and a predictably worsened glottic view. A proper ramped position (Figure C) maintains the optimal glottic view with coordinated flexion-extension while also allowing for improved pre-oxygenation through increased functional residual capacity. According to these anesthesiologists, the Check-UP study needs a do-over. From cited article - click for PubMed link.